​Captain William Turner went to sea at the age of thirteen. He joined the Cunard Line in 1883 and became a Cunard captain in 1907. On May 1st 1915 the Lusitania left New York for Liverpool with Captain Turner as her master. At 2.10 p.m. on the 7th May a German U-Boat torpedoed the Lusitania. 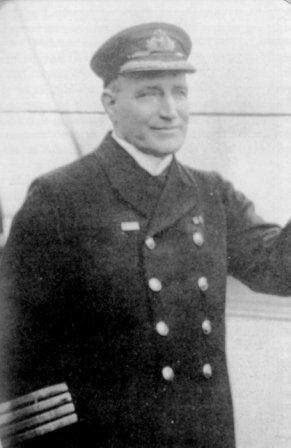 The captain of the U-Boat was staggered by the effect of his single torpedo: the superstructure at the point of impact and the bridge were torn asunder, fire broke out and smoke enveloped the high bridge. In the chaos only six of the forty eight lifeboats were successfully launched. The ship went down in eighteen minutes. One thousand two hundred and one people were lost. Seven hundred and sixty four were saved, including Captain Turner. Turner continued with Cunard until 1921, when Winston Churchill (ex-1st Lord of the Admiralty) published The World Crisis in which he inaccurately and unjustly blamed Turner for the Lusitania disaster. Unable to face the renewed publicity and criticism, Turner retired to Crosby, but was buried in the family grave in Wallasey in 1933.